WellWishers Australia - help us to fund hand dug water wells in Tigray Province, Ethiopia. We have a very straightforward program. WellWishers does the fundraising, REST does the implementation. WellWishers functions on the generosity of volunteer labour, so our overheads are negligible. Every $6800 of our WellWishers support provides a village with clean permanent nearby water, eliminating water-borne diseases that cause high infant mortality, saving lives and providing new opportunities - especially for women and girls. We are accountable to the Australian Charities and Not-for-profits Commission (www.acnc.gov.au), where you can access our financial reports. 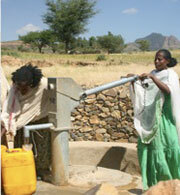 WellWishers Australia - funding hand dug water wells in Tigray Province, Ethiopia. We value any support you can give to this life-saving program. In November 2011, The Australian Government approved WellWishers as a Designated Gift Recipient, meaning we can issue tax deductible receipts for donations.